2000: The GBA Hawk series of aircraft has brought the modern, conventional gyroplane to performance standards that make it a viable alternative to some helicopter roles. The initial entry gyroplane called the Hawk 4 at one point appeared to be as if it would be a marketed aircraft but GBA decided to utilize the Hawk 4 as a protype for a new Hawk 5 gyroplane. The Hawk 4 demonstrator/prototype Hawk 5 aircraft flew security missions during the 2000 Winter Olympic games. While on duty with the Utah Public Safety Command (UOPSC) the Hawk 4 performed some very impressive statistics. The craft flew approximately 67 missions in 75 flight hours with no maintenance actions. The aircraft quickly got the attention not only of the general public but that of members of Congress and the Senate. The gyroplane was brought before serious consideration for Homeland Security duty but was never realized. The Hawk 5 is the production version of the Hawk 4 demonstrator with many revisions and modifications. The Hawk 5 boasts greater range and endurance, a greater gross weight and useful load, higher cruise and max. speeds and vertical takeoff and landing capability. The Hawk 5 has a 42ft, two-bladed rotor system. The fuselage length is 24ft and is 13ft 6in in height. The gyroplane is powered by a Rolls Royce 250c20s turbine engine. 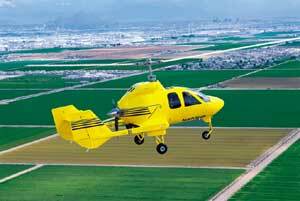 Should the Hawk 5 enter production it will be the first FAA certificated gyroplane in the United States. The ship has a capacity to carry five but would most likey carry a maximum of four when fully outfiited for a police or military type role. In December of 2006 Groen Brothers Aviation released a statement that production and continuance of FAA certification would proceed in a joint venture agreement with the government of Spain. A production factory for the Hawk 5 is planned for the city of Argon. The capabilities of the Hawk gyroplanes combined with low operating costs make this aircraft a very viable option for law enforcement agencies on a tight budget and air tour operators. Coastal, facility and port patrols can be conducted at a fraction of the cost of a helicopter. With operational speeds ranging from 46 to 165 mph this versatile aircraft shows a lot of potential. GBA has a passion for innovative design in their gyroplanes.